The Vienna Art Orchestra was a phenomenal ensemble led by saxophonist, arranger and composer Mathias Ruegg. The original lineup changed over the years, eventually to form a group made up of a jazz big band, with added percussion and woodwind instruments found in the symphonic orchestra. 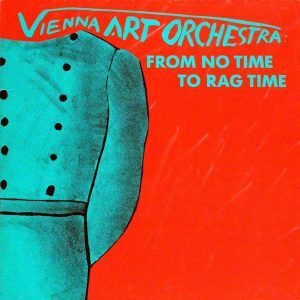 From No Time To Rag Time was the first record I ever heard of them, and right away my first impression was that it is highly virtuosic and advanced music. I was amazed by the level of musicianship from all the players, the complexity of the solos and the interesting orchestration and arrangements. The opening track, titled Variations about n 508-10 (4g) is a quirky cacophony of sounds that tips the hat on different genres. The piece opens with a fast and complicated line featuring a soprano singer, a xylophone and a woodwind instrument (possibly a clarinet) all playing in unison. The opening phrase leads to a more straightforward section that starts with a canon played by the oboe (imitating a typical jazz walking bass line) then the vocalist enters, and then the trumpet plays a short solo while the percussion provides a steady swing beat. The band goes back to the opening phrase and again is followed by the B section with the walking bass line and trumpet solo. It then repeats back to the first phrase, but this time the drum set plays hits and fills that come unexpectedly, bringing in the band to a chaotic section with a lot of playing by various instruments in full swing mode. Suddenly, the band stops and the piano plays a complex and lengthy solo, with heavy dissonances throughout. After the piano solo the band comes in again, and the saxophone takes the next solo while the ensemble provides support. The piece ends with the vocalist and the trumpet trading lines. We can recognize the influence of jazz and the sound of the swing big bands flirting with classical music, postmodernism aesthetics, atonality and free jazz. The next track is a slower, cool jazzy tune called Variations About Keep Your Heart Right. 5 of the 8 tracks in this album have the word “Variations” in it, which makes me wonder if indeed they are variations on previous compositions either by the bandleader or by other composers. The saxophones are featured predominantly and there are also memorable vocal lines in unison with the band. After the first dual saxophone solos, the band returns to the opening theme but then shifts gears to a faster tempo, setting up the mood for a cool trombone solo. Following the t-bone comes another saxophone solo, this time longer and without accompaniment, and then the big band kicks in at the same bright tempo as before. Finally, the coda has ensemble hits that are punched by the drum set and has an interesting blend of the different ensemble sections and timbres of the orchestra. The 3rd track, Variations About Silence, features the soprano, exploring more of the free jazz aesthetics are. Next, the tune Un Poco Loco has more of a latin feel, with lively beats using cowbells and latin percussion and horn lines that have swing phrasing but also a bit of a Spanish flavor. The whole piece is played with a steady upbeat tempo, which is a nice break from the mostly swung rhythm of the previous tracks. As with many jazz records, this album includes a lyrical jazz ballad called Variations About a Liberate Proposal. The drummer plays with brushes and adds nice effects on the cymbals while the percussionist enhances the tune with different effects using an array of instruments, including gongs, bells, chimes, jingles, maracas and other toys. But the saxophone is the main protagonist here, playing the main themes and lengthy solos while the band lays down the accompaniment. At the very end, the tempo is sped up and the piece ends with complicated phrases played by the saxophone and sung by the soprano in unison, a common trait used throughout the album. From No Time To Rag Time is an interesting blend of contrasting schools and genres that in my opinion works well in exploring something new, sort of like the Third Stream concept does. This is a record that takes time to digest and thoroughly appreciate its nuances. It is a great piece of art and certainly one of my favorite big band crossover experiments. Nick Vasallo is a young up and coming composer from California. He has written choral works, chamber music and pieces that experiment with electric guitars, bass and drumset that blends influences from classical music and death metal. “The Moment Before Death Stretches…” is a piece for chamber orchestra that calls for a variety of instruments, some of which use extended techniques, making good use of the timbral palette. The orchestration calls for: percussion (vibraphone, cymbals, concert toms) piano, strings (violin and cello) brass (trombone, baritone sax) woodwinds (oboe, flute) electric guitar, synthesizer and vocals. The video starts with a stopwatch which serves as a guide for the musicians. There is no conductor, but each player has written cues indicating what and when to play. At the beginning we hear a very low pitch being played on the contrabass with a bow. Then, the percussionist also uses a bow to rub a key from the vibraphone, producing a piercing, high pitched sound. She adds cymbal effects while the contrabass keeps repeating the same note. The mass of sound starts intensifying and getting more and more dense with the addition of strings and what sounds like throat singing or a didgeridoo at a soft volume, possibly played on a synth or from a laptop computer. Afterwards, the pianist plays by herself, repeating the same pitch the contrabass was playing but creating a very cool effect that sounds sort of like a reverb. This is achieved by pressing some of the piano keys halfway, creating sympathetic resonance. All of this makes it sound even more ominous, anticipating the huge sound that’s about to arrive. The pianist plays in unison with the percussionist with one hand and with the other rubs a screwdriver against the piano strings. Then, a throbbing, steady and low pitched sound makes an appearance and introduces more string instruments which start playing along with the electronic low end sound. The ensemble starts building up, playing faster and louder, with the percussion pounding on the concert toms until the music erupts in loud, steady, slow attacks. In this section we hear brass, strings, percussion and piano along with the electronic low end. This part reminds me of the suspenseful feeling used by many composers in movie trailers. The next section begins with the piano playing fast repeated notes in octaves for a brief moment and then comes to a halt. The electric guitar makes an entrance by itself, and then more of the vibraphone bowing before we hear delicate singing by female vocalists with the strings playing long notes, getting louder and doing glissando up the instrument. Suddenly, the throbbing low end sound is played again by the brass on the same pitch, while a flute plays fast flurries and the percussionist plays fast, loud and aggressively on the concert toms. The ensemble stops suddenly, leaving only a faint sound lingering, only to begin again on a loud tutti but this time on a different pitch. At this point, the shift in pitch feels like we have arrived to a climactic resolution, with the brass providing the low end and the piano playing rapid notes in octaves, while the strings play tremolos and trills and the soprano sings high notes with vibrato technique. I would compare this section to a fermata at the end of a concerto. This part is cut off abruptly, giving us a nice contrast, and the piece ends with a sort of codetta that has very soft singing by the alto, along with violin and cello holding long notes for a few seconds until the piece comes to an end. The piece has no formal bar lines, melodies or motifs, or even a clear structural scheme. Rather it is more of an experiment on timbre, sound combinations and pure expression. In the attached link we can see a performance recorded by Wild Rumpus, a chamber ensemble that focuses on music from living composers. On Sunday, March 14th I went to see a live performance at the Merkin Concert Hall, Kaufman Music Center in downtown New York. The event was a part of the ongoing Ecstatic Music Festival. The show was broadcast live through WNYC and hosted by John Schaefer. The program for the evening was filled with wonderful new compositions commissioned by the performing ensemble. The roster of composers whose work was featured included Nick Zammuto, William Brittelle, Toby Twining, Fred Hersch and Caroline Shaw. The ensemble performing these new compositions was none other than Grammy award winning group ROOMFUL OF TEETH, an outstanding vocal octet made up of 4 female and 4 male singers that specialize in modern music utilizing extended techniques such as Tuvan throat singing, yodeling, and other techniques from non-western music. They have a rich, expressive and full sound with a wide tonal palette. Because the pieces were commissioned specifically for this group the music made good use of their capabilities. As I walked in the beautiful theater (unfortunately a few minutes after the beginning) they were getting ready to perform a piece by Nick Zammuto while the host interviewed the composer and asked about the piece and compositional process. The title of the piece was “ToBeGinAGain” and it is written in 6 movements for 8 voices and synthesizer, played by the composer himself. Each movement featured a different soloist singer who stood next to the synth on a separate microphone and put on earphones (perhaps listening to a click track) while the rest of the vocalists provided accompaniment and Zammuto played with the rhythms and pitches that the soloist sang into the microphone. 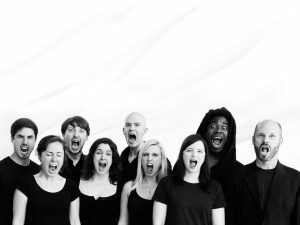 The manipulation of the sounds was purposefully done with a degree of randomness that created an interesting effect when interacting with the singers. I could hear pitch modulations, rhythmic delays and interesting harmonic effects provided by the synth and enhanced by the other singers. To me, the music was ethereal and buoyant, definitely tonal but mostly modal, with rich harmonies and interesting rhythmic devices. There were no cadences or predictably symmetrical phrases. This music reminded me of the soundtrack of a 1988 cult classic animated movie called “Akira”. The performance was conducted by the group’s musical director, Mr Brad Wells. He was interviewed by the host briefly and talked about the collaboration with the different composers. He also pointed out that some of the pieces were being performed live for that audience for the first time in New York. An interesting detail that I observed was that all of the performers and the conductor were using digital tablets instead of standard sheet music (which makes more sense and is cleaner and neater than shuffling through pages in the middle of a performance). The second piece of the program, titled “Overtonework” by Toby Twining, was not performed for some reason. Apparently they cut it from the program perhaps because of time limitations. Next, they sang a piece named “Two Haiku” by composer Fred Hersch. The poem was commissioned to be written as an homage to a recently deceased renowned jazz vocalist Steve Zegree. This piece was performed a cappella, and it was interesting to hear the group singing music with lyrics: two beautiful haiku written by Mary Jo Salter. After a brief intermission, the main dish of the evening! An outstanding work by Pulitzer-prize winner Caroline Shaw titled “The Isle”. The composer could not attend the event due to other commitments. Shaw is also an excellent vocalist who sometimes collaborates with Roomful of Teeth PLUS a renowned violinist who tours and records with her own string ensemble. Before the performance, the director talked a little bit about the composition, explaining that the inspiration behind it was Shakespeare’s The Tempest”. This piece was considerably longer than the others and used some of the dialogue from the play. I could hear musical quotes from Caroline Shaw’s previous collaboration with Roomful of Teeth titled “Partita for 8 voices”. The evening was filled with wonderful music and an amazing display of virtuosity. After the program was performed and the group got offstage, the audience gave them a standing ovation and they returned for an encore: an interesting arrangement of the music of a popular new TV show which I cannot recall the name of. Here is a link to a performance featuring Caroline Shaw on lead (in the first piece) as part of the Tiny Desk concert series.